SAN FRANCISCO — Museum of Robots in Second Life debuts its line of real world housewares at the New York International Gift Fair. The line features plates and tableware with a robot motif and will be available for wholesale purchase. Virtual versions of the product will be available at the Museum’s gift store in Second Life. 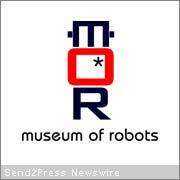 Museum of Robots offers visitors an immersive experience with art, exhibits and robot-related events. With its new product line, the Museum crosses over from virtual to real with products that are designed to capture the unique blend of future and nostalgia that robots represent. Museum of Robots is dedicated to the appreciation of robots. Its mission is to promote understanding of the place of robots in popular culture, art, and science and features exhibits, art, and special events. Current exhibits include: “The Art of Eric Joyner” featuring selected works from his new book, “Robots and Donuts”; Celebrity Robots Hall of Fame, featuring famous robots of cinema and television; Toy Robots, featuring toy robots from a private collection, and Bot Shots, featuring robot photography. More information: http://www.MuseumofRobots.com.